Mayor Leo Lutz swears in Rebecca Denlinger as Columbia Borough manager at Monday's borough council meeting. 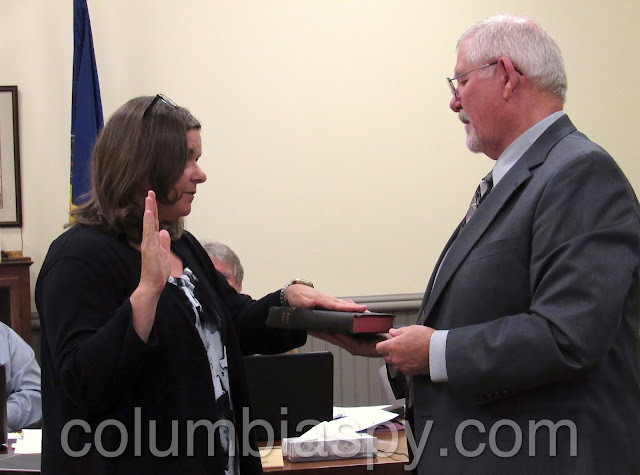 Rebecca Denlinger took the reins as Columbia's new borough manager at Monday's Columbia Borough Council meeting. Denlinger had been serving as a full-time Community/Economic Development Director/Assistant Borough Manager since January 1 of this year. She was being groomed to become borough manager at the end of this year, but the position opened up early when Greg Sahd resigned last month. Denlinger holds a Bachelor’s Degree in Political Science and Economics from the University of Delaware, and a Master’s in Public Administration from Penn State. She has worked with the Elizabethtown Area Chamber of Commerce, Rettew Associates, Inc., and the Lancaster County Planning Commission and also served as a consultant for Marietta Borough last year. She and the mayor were told it was a ILLEAGEL HIRING and they did it any way, COLUMBIA LEADERSHIP . Bring on the law suites , thank you mayor and council still costing tax payers money. This was a fixed deal.No one had a chance to apply for the job. boro does need checked on and especially the people we voted for to work for us. It's like a puppet show they all shake their heads to yes. Initially, Rebecca Denlinger was hired by the Borough of Columbia, as an independent consultant. This was approved by the Borough Council, at a public meeting. The meeting is open to the public. Furthermore, Ms. Denlinger, was appointed as Assistant Borough Manager. This was approved by Borough Council, at a public meeting. This meeting is open to the public. This meeting is open to the public. Thus, Ms. Denlinger became a Borough employee. Additionally, when the previous Borough Manager, Greg Sahd, left the Borough, Ms. Denlinger, as an EXISTING EMPLOYEE, was PROMOTED to the position of Borough Manager. Because she was promoted, Borough Council was not required to advertise the position. Furthermore, EOE hiring policies were not required because this was a promotion. As it stands, Ms. Denlinger is Columbia Borough's first female Borough Manager. The assistant borough manager position was not advertised after the ordinance creating the position was passed. Even as an independent contractor, she was provided an office in the municipal building. Hooray to Columbia for hiring its first female borough manager. Let's hope it's the beginning of the end for the "old boys" club. She is what Leo wanted all long!